DELRAY BEACH, Fla. (October 14, 2013) – Cloud Computing Concepts (C3) — a leading provider of Cloud-based and on-site technology solutions, services, and management for organizations nationwide — has relocated its headquarters to Delray Beach in the heart of the city’s downtown district at 110 East Atlantic Avenue, Suite 420. The new penthouse level 2,500-square-foot facility will include a 24×7 Network Operations Center, a state-of-the-art technology demonstration lab, and several additional seats for C3’s expanding technical support team. The move is the latest of several expansions for the fast-growing and award-winning firm. In the past 18 months, the company has added an additional data center in New York City and several new highly skilled network engineers. C3 has also rolled out new services — including a high-performance Cloud-based disaster recovery and business continuity solution — to meet the evolving needs of its burgeoning client base. Soon, C3 will also announce the availability of its third data center in Miami, Fla. and will then turn its sights to opening its fourth just outside of Las Vegas, Nev.
C3 cost-effectively brings enterprise grade cloud computing technologies, services, and support to small and medium sized businesses nationwide. Its cloud-based approach eliminates the need for substantial IT-related capital investments. Instead, C3 provides on-demand access to computing resources, flexible pay-as-you-go billing, 24×7 remote support, and expert on-site support. The C3 solution immediately drives down IT costs, increases stability, enhances security, provides for employee mobility, is environmentally friendly, and ensures business continuity in the event of a disaster. C3 provides clients a choice of Hosted Cloud, On-site Cloud, or Hybrid Cloud, thus enabling the development and deployment of true client-driven solutions. The firm was recently tapped by the South Florida Digital Alliance (SFDA) as the only Cloud-based and custom IT service provider in the state. Further, C3 was recently ranked as number 84 among the world’s top 100 cloud service providers (CSPs) in the Nine Lives Media’s second-annual Talkin’ Cloud 100 report, and was recognized as a 2012 Florida Company to Watch by the Florida Economic Gardening Institute (GrowFL) at the University of Central Florida. 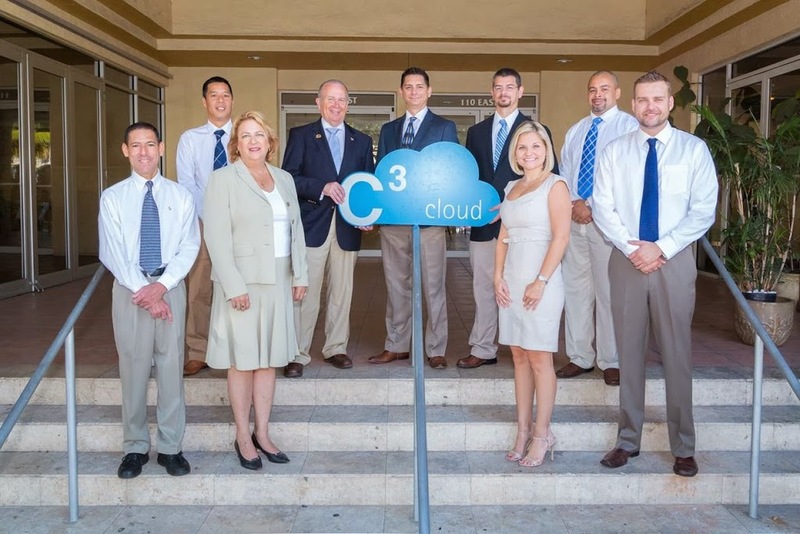 To learn more about C3 and how its unique combination of Cloud-based solutions and on-site support can help organizations grow and prosper, visit www.c3office.com or call (561) 939-4035. Cloud Computing Concepts (C3) cost effectively brings enterprise grade cloud computing technologies, services, and support to small and medium sized businesses nationwide. C3’s cloud based approach eliminates the need for substantial IT related capital investments. Instead, C3 provides on-demand access to computing resources, flexible pay-as-you-go billing, and expert on site support. The C3 solution immediately drives down IT costs, increases stability, enhances security, provides for employee mobility, is environmentally friendly, and ensures business continuity in the event of a disaster. Further information is available at http://www.c3office.com or by calling 561.939.4035. (L to R ) Stuart Sycle, Irene Revelas, Lester Chin Cheong, Mike Wolfson, Rick Mancinelli, Robert Mancinelli, Lindsay Sturm, Byron Dent and Alex Hortynski.